Every city needs superheroes – even a city of bugs! 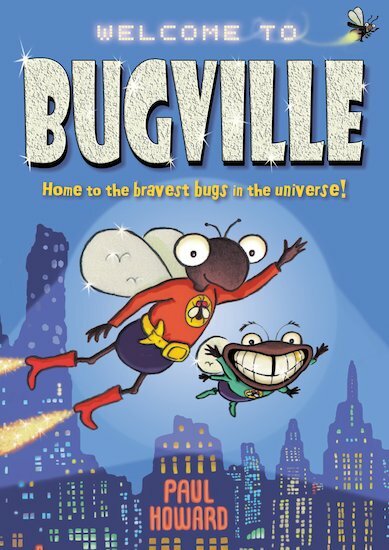 Home to millions of insects, Bugville used to be a rotten, crime-ridden city that reeked of stale underpants. Then Superfly and Midge hit the streets! Two tiny home-grown heroes who fight crime wherever it strikes, taking on villains like Nasty Nat (the nastiest gnat in Bugville) and giant robotic goo-shooting caterpillars. All before heading home for a tasty lice-cream! But now Electro Slug and his sneaky sidekick have come up with a plan to get rid of the heroes forever. Can these brave bugs escape a fate even worse than (gulp!) the dreaded swat? You’ll have a good slime finding out! Paul Howard won the Blue Peter Best Book to Read Aloud award for The Bravest Ever Bear, his collaboration with Allan Ahlberg.